Announcement Hello and welcome to my little shop! My turnaround time is approximately 1-2 weeks before shipping. Every HattieRex tag is made to order according to your specifications. Prefer a different font, want a different metal, or care to rearrange the text? No problem. 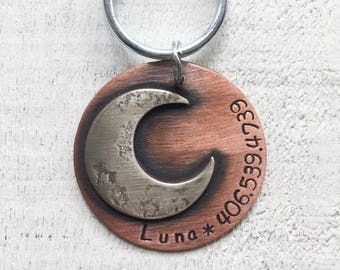 Contact me to get started customizing a unique tag that will keep your pet safe and stylish. Each of our font options, comes in only one size, the one in which it is pictured. Please note that requesting a particular font may effect the layout of your tag and personalized text. Have a quick question? You can call or text 406.539.4739. Our retail location is 18 S. Willson in Bozeman, Montana. Business hours are 10-5 Monday through Saturday. 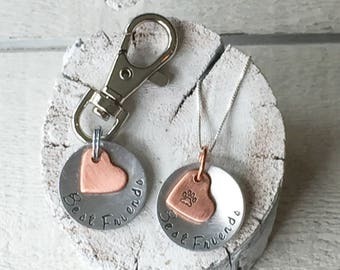 http://www.etsy.com/featured_seller.php?featured_user_id=6627386 and be sure to check out HattieRex.etsy.com for personalized jewelry, wine charms, keychains, backpack pulls and more! Do you enjoy Make Your Dog Smile and Hattie Rex? Like us on Facebook and follow us on Twitter, Instagram and Pinterest. Hello and welcome to my little shop! My turnaround time is approximately 1-2 weeks before shipping. Always receive great customer service and perfect items. I’ll be back again. I love these dog tags. This was my second one ordered for my new girl of the family. Meet Cassandra. What do you do at Hattie Rex? T.C.O.B! More specifically, I am the Operations Coordinator which means I get to do a little of everything from computers to power tools and everything in-between :) What did you do pre-Hattie? Barista and all around coffee snob. I have toned this down somewhat since Hattie came into my life, I think. Where's home? Montana. What's your favorite Hattie product? At the moment...probably the Chevron and Chevron Stratus necklaces. What's your favorite dinosaur? T-Rex, always and forever! What's your hidden talent? Fine art works created in Microsoft Paint Program, the older the version the better. What's your spirit animal? Raccoon! (aka Trash Pandas) What makes you feel alive? Thunder storms. Who (or what or where) warms your heart? Raccoons. Montana. All dogs. Some cats. Making things. Friends. Family. Mountains. Videos of when a Military person comes home and their dog is so excited to see them. Whiskey. Welcome to my little Etsy shop! MakeYourDogSmile is the canine division of HattieRex! Here at HattieRex, we're proud to make unique and custom pieces of wearable art for every four-legged member of your family. As pet owners, we know how important it is for your critter to be properly identified should the unthinkable happen. We are also a stylish group of people and we want our pets -- and yours -- to be stylish, too! HattieRex/MakeYourDogSmile products have been featured in Modern Dog, City Dog, Country Living, Mirror Mirror and HGTV! Please feel free to convo me with any questions you may have. *Wholesale inquiries and custom orders are always welcome! Thank you for understanding and for supporting small, handmade businesses. My preferred method of payment is PayPal. I begin work on each item only after payment is received. Please remit payment as soon as possible after each purchase. Please note that the current creation time is always listed in the shop announcement. Thanks for your understanding and support. Turnaround time does not include transportation time. I ship via USPS first class or priority mail. I always ship to the address listed on Etsy. Please do not list shipping addresses in the "message to seller", via email, PayPal, or convo. If you need it in a hurry, please convo me to discuss options. All orders will receive email notification when the item ships. Domestic orders will receive delivery confirmation. Please contact me with your wholesale inquiries. I'd love to work with you! All content on this web site or web page is the property of Tessa Burnett dba Good Dog and is protected by U.S. and International Copyright Laws. This includes text, graphics, icons, illustrations, designs, photographs, images, written and other materials (hereinafter, the "Contents") are copyrights, and/or other intellectual property owned by Tessa Burnett dba and are protected by U.S. and International copyright laws. The compilation (meaning the collection, arrangement, and/or assembly) of any and all content on this web site is the exclusive property of Tessa Burnett dba HattieRex/MakeYourDogSmile, and is also protected by U.S. and International copyright laws. You may not copy, publish, distribute, create derivative works of/from, or commercially exploit any of the Contents of this web site, or use this web site for any other purpose than as a shopping resource.